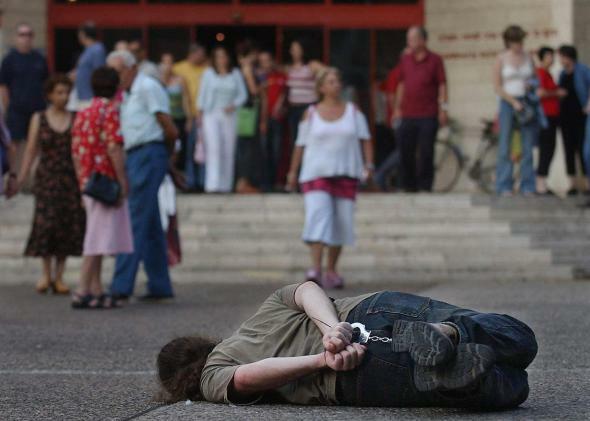 An Israeli activist demonstrates one of the techniques used to extract information from inmates in Israeli prisons to mark Saturday’s international day for victims of torture in Tel Aviv, 26 June 2004. The United States, though, is not the only democracy to have tortured. In fact, in justifying the interrogation program, its architects drew on the experiences of two of America’s closest allies. According to the human rights group B’Tselem, Israel’s internal security service, the Shin Bet, used physical force against at least 850 persons per year in the years following the Landau Commission, usually not in the “ticking bomb” scenarios the report had used to justify such methods. These methods include depriving prisoners of sleep, forcing them into “stress positions,” threatening them, subjecting them to extreme temperatures, and blasting them with loud music—all methods that would later become commonplace in CIA interrogations. In 1999, the Israeli Supreme Court banned the Shin Bet from using Landau-approved techniques, but still allowed interrogators to invoke the “defense of necessity” if they were later faced with prosecution. The agency returned to coercive interrogations soon after, when the Second Intifada broke out. While such tactics are routinely condemned by human rights groups, most Israelis, like most Americans, believe they are justified to prevent terrorist attacks. But even some who defend Israel’s interrogation practices argue that the U.S. drew the wrong lessons from the country’s experience. John Schindler, a former NSA employee and historian whose take on the Senate report was cited by my colleague Ben Mathis-Lilley last week, argues that while Shin Bet employs “what outsiders would term torture on occasion, those conditions are tightly controlled by legal authorities.” Interrogators are also highly trained and fluent in Arabic. Israel isn’t the only country whose experience was examined by the Bush administration’s lawyers. In a post on the Irish political blog Slugger O’Toole, Patrick Corrigan, Northern Ireland program director for Amnesty International, writes that in the now infamous 2002 “torture memos” which advised the CIA and the administration on the legality of “enhanced” interrogation, assistant attorney general Jay Bybee quoted from a European Court of Human Rights decision on Britain’s treatment of prisoners in Northern Ireland during the 1970s. During the Troubles, British security forces developed what became known as the “five techniques” for interrogations of IRA suspects: hooding, “wall-standing” (a kind of stress position), subjection to noise, sleep deprivation, and denial of food and water. When the techniques were made public in 1972, they were banned for future interrogations by Prime Minister Edward Heath. Shortly afterward, the Irish government filed a case against Britain in international court against Britain alleging torture in violation of the European Convention on Human Rights. In 1978, the European Court of Human Rights ruled that the interrogation methods amounted to “inhuman and degrading” treatment, but not torture. Following a recent Irish TV documentary which alleged that the British government had misled the investigation, the Irish government recently announced plans to ask the European Court of Human Rights to revise its judgment. The 2002 memos used this case to bolster the argument that U.S. interrogations did not constitute torture. Variations on all of the five techniques were employed by the CIA during the period covered by the Senate’s report. Bybee apparently ignored the fact that though the British government denied “torture,” it still found the techniques illegal under British law. Proponents of the U.S. interrogation program took from these examples that government can get away with an awful lot of mistreatment without having to call it “torture.” Israel’s experience is also a reminder that security forces will find ways to exploit the loopholes left open in legal judgments. This is concerning given that the Obama administration is reluctant to launch any prosecutions program and that its legal position on torture leaves some troubling ambiguity on the topic of “black site” prisons. And the British interrogations, still being argued in court four decades later, suggest that even if the U.S. is completely finished with torture, the controversy over the program is far from over.